And you can thank me now for NOT posting the photographic evidence of the dead mouse found UNDER a rug in the laundry room. "Hmmm, it seems to have a tail attached." lolol Flat as a fritter, too. Anyway, the kid was having fun last night, playing on the new quilt. It really fired up her rockets, I don't know, maybe it's the busy-ness of it? She was having fun though, rolling around and showing off all her little bits and pieces. Shameless hussy! "Flat as a fritter"? Now yer talkin!! Just dip in egg and pat with flour, a little salt and pepper, fry up till golden brown, and you have a little appetizer with a glass of wine. Paula Dean would take back her cook book if she heard me. Okay, I'll stop now. NO more critter food jokes - I promise. Really. How unladylike! 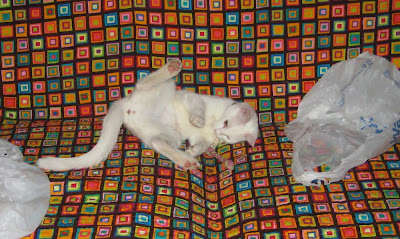 But it's a clear demonstration of how important it is for a cat to be able to break in a new quilt by fuzzing it. LOL at the mouse. ewww. ohmy your cats are soo cute!